My friend lent me Giraffe Juice and promised I would feel so much better, and I did. I felt better about many situations I encounter in school, and at home etc. I loved the book so much I wrote a book report on it and got an A+. I just wanted to say thank you very much. I am starting to use Marvel's four steps in my every day life. Hi there! I just wanted to let you know that after studying and practicing NVC since 2002, I have come accross many things to help with kids that have brought the spirit of NVC into our home. My son loved your book. He has used what he has learned and we have both noticed more motivation and skill around communicating with NVC. Thank you, thank you, thank you! This is a treasure of a book for children and adults, too. 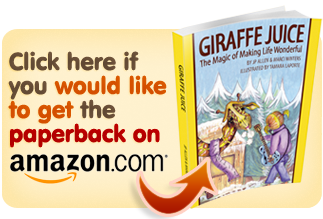 Giraffe Juice invites us to experience an adventure story rooted in a game called "Making Life Wonderful." 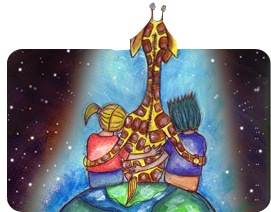 Eva, a harmonica and guitar-playing 13-year-old girl, and her two school friends, are guided by one very supportive talking giraffe, Marvel. Together, their trials and successes show the practical and miraculous gifts of Compassionate Communication. 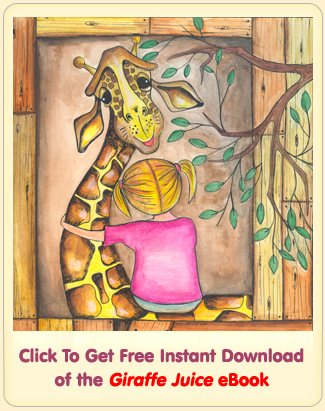 Their strategy is in using the magic of "The Making Life Wonderful" Game... carefully and thoughtfully illuminated, woven into a story about how children and adults can learn to get along very well. 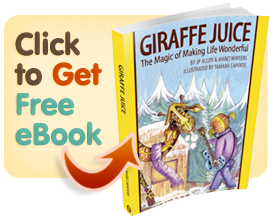 And the full length Giraffe Juice Audio Book!!! A $35 value that we're stoked to gift you because you'll be helping us serve our mission of contributing to as many people as possible.